Bin Weevils Animated Music Video is Launched! Behind the Scenes with our Bin Weevils Prize Winners! Take a look behind the scenes on the shoot for the new animated Bin Weevils music video, created by our competition winners! Last month we teamed up with kids’ online virtual world, Bin Weevils, to launch an exciting music video animation competition. Take a look at the finalists here! Bring Gromit to life in At-Bristol this summer! In support of the fantastic Bristol Gromit Unleashed campaign, At-Bristol science centre is having a summer of cracking Wallace & Gromit fun! Take Part in a Gnasher Model Making Session at Beanotown! Aardman model maker Jim Parkyn will be running some very special Gnasher model making workshops at Beanotown in the Southbank Centre in London this weekend! Download 3D Shaun Adventures for Your Nintendo 3DS! If you loved watching the adventures of Shaun the Sheep on Nintendo 3DS for a limited time last year, you’ll be excited to hear that these exclusive video clips are now available for purchase in the Nintendo eShop for Nintendo 3DS, so you can watch them again whenever you like! The Art of Wallace & Gromit Opens at the Rheged Centre in Cumbria! EXHIBITION: Head to the Rheged centre in Cumbria this summer for a fantastic new Wallace & Gromit exhibition. Take a look at real-life sets from the films, learn how to make models like the pros and even try your hand at animation! Sink and Swim Competition Winner Announced! Last month we asked you to create an animation using the ‘sinking’ technique show in our tutorial video. After a tough judging process, we’re delighted to announce the winner…. We had so many brilliant entries into our “Swimming and Sinking” competition that we wanted to share some with you for inspiration. Well done to everyone that took part! With the Gromit Unleashed arts trail now open to the public, this month’s challenge is all about Gromit! 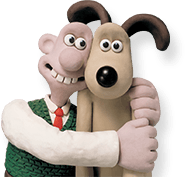 We’d like you to create your own Gromit-themed short film – the story is up to you and you can use any style of animation you like, whether it be 2D drawn animation, 3D clay models, or anything else you can think of!